The Roseville Pottery company introduced the Rozane Line in 1917. Sometimes referred to as Rozane Line or Rozane 1917 is not readily confused with the standard glaze Rozane or Rozane Royal. 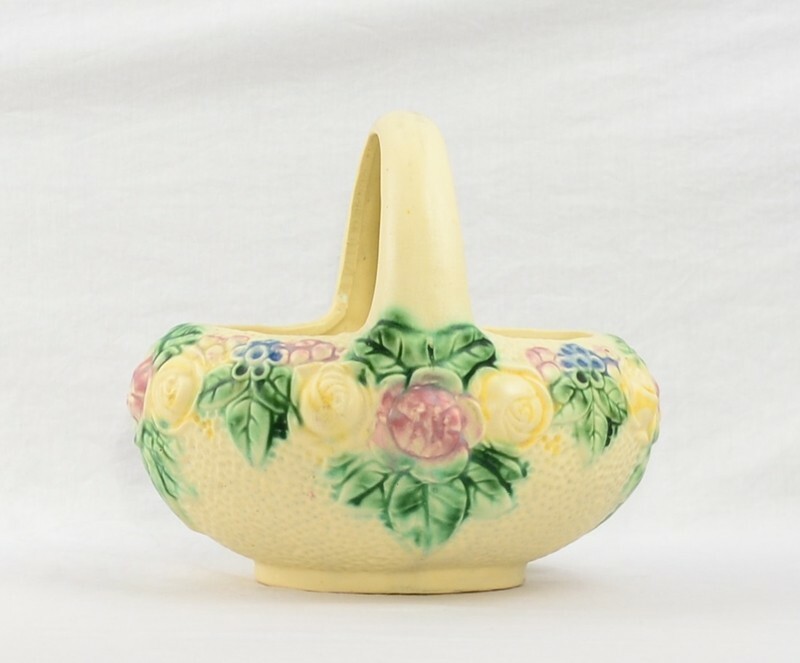 This line is a heavily textured background in cream with multi-color heavy floral and leaf pattern that surrounds the entire vessel. The background is usually in cream or pale green. The pieces are usually unmarked and rarely stamped. This is a beautiful Rozane Line Basket with exceptional detail. The handle is in great condition with some wear and the flowers look beautiful. This would make a wonderful basket to hold your favorite flowers or fruit. What a great addition to anyone's Roseville collection. This is a beautiful basket and is waiting for a new home. Exceptional basket in that it is undamaged, no chips, no cracks, no scratches to glaze. Very very minor underglaze crazing on this wonderful vase. It may appear more pronounced due to the macro lens used for the photography. Any non-perfections are from the firing/manufacturing process including glaze pops. The white spots are studio light reflections. Dimensions are below. H: 7 1/4", Base: 4 1/4" x 3", Rim: 6 1/4" x 4 3/4"